The Google Pixel 2 and Pixel 2 XL are fantastic, pure Android phones. Despite being released in 2017, the Pixel 2 devices still receive steady updates directly from Google, including the latest updates to Android 9.0 Pie (see Appuals guide How to Upgrade Google Pixel 2 from Oreo to Pie). In this guide, we will show you how to unlock the bootloader on your Pixel 2 / Pixel 2 XL, and root it using Magisk. It’s a very simple process, so just follow our guide carefully, and comment if anything goes wrong (it shouldn’t). Please be aware that unlocking the bootloader will wipe your phone (factory reset). You should backup any important data before proceeding. Open your Settings > About Phone > tap Build Number 7 times to activate Developer Mode. Go to Settings > Developer Options > enable both USB Debugging and OEM Unlocking. Connect your Pixel 2 to your PC via USB, and launch an ADB terminal on your PC (hold Shift + right click and choose ‘Open a Command Window Here’). This should display your device’s serial number in the output prompt – if it says your device is not recognized, device offline, or displays no device at all, you may need to try reconnecting the USB, or troubleshooting your USB drivers (also accept the ADB pairing dialogue on your Pixel 2 screen). Your Pixel 2 should immediately reboot into Bootloader Mode. Now you need to decide if you want to do a standard or critical unlock. The difference is that a critical unlock will allow you to directly flash bootloader files, and changes the ADB commands you will use. You now need to follow the prompts on your Pixel 2 – when its all done, reboot the device. You may now proceed through the Android setup wizard. Pixel 2 rooted with Magisk. Download the Magisk Manager APK onto your device. Also grab one of the latest boot images for the Pixel 2 or Pixel 2 XL. Place both of these files on your SD card. Go through the steps to enable USB Debugging, and also enable Unknown Sources on your device. Install the Manager Manager APK on your Pixel 2, and launch it. In Magisk Manager app, press the Install button, then choose Patch Boot Image File. 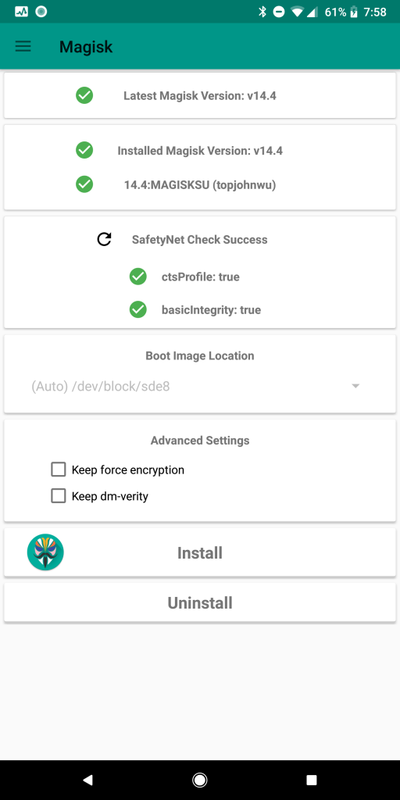 Choose the boot image you want Magisk to patch (the one you transferred to your SD card, of course!). This will send the patched boot image to your main ADB folder. Now when you’re back in the Android system, you can open the Magisk Manager app, and it should confirm your root status!